p cubed presentations is a concept about presentations and how to improve them. The aim is to share ideas about presentations, their construction, design and delivery such that the message is not lost, in time, like tears in rain. A mission statement, if you are looking for such is here. This site evolved from a series of blog posts. They have been organised into a resource structured around this p cubed idea. Use the pull down menu to read a small summary, list of key posts and then most recent posts in that category. Each post effectively answers a single question but has links to other posts within the site to give clarity and explanation on more specific topics. If you want just to catch up on the latest posts go here. The basic p cubed concept is that a presentation is the product of three presentations; the story (p1), the supportive media (p2) and its delivery (p3). 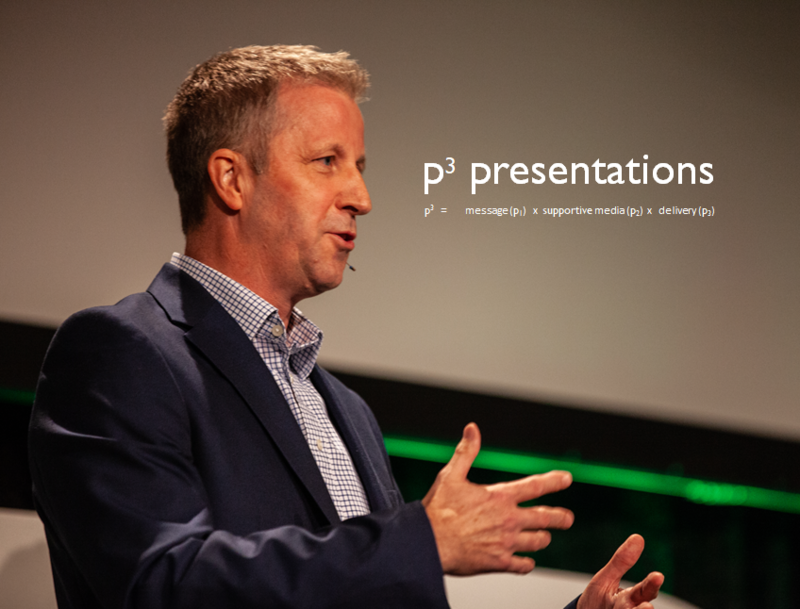 The value of a presentation is the product of these three presentations the p cubed value. The science of fail is a discussion on the science behind the reasons presentations as we currently know them fail. There is an FAQ with some of the initial questions folks ask. It links to blogposts. The concept has been developed by me but in a series of guest posts there is an increasing number of reflections from colleagues who have used this technique to improve their presentations. If you would like to add your voice, please let me know. Adding to the multi-media learning approach there are podcasts on some issues and I’m always looking for new topics. The blog posts happen fairly regularly and are often a response to questions and discussions from twitter. Please follow me @ffolliet and join the discussion there. Each post has a comments section and this too should add to the debate. Please don’t feel I have all the knowledge, join the debate on twitter and together, we can improve presentations. Lastly, if you would like me to visit your place of work, a conference or organisation to give a p cubed presentation or run a workshop, then just leave a message. We can talk! with thanks to Ian Summers for his amazing photo.